Nokia unveiled three new phones today as part of their Everyone Connect launch, (press release here). “Everyone Connect” is Nokia’s attempted at bringing E-Mail, Instant Messaging and Social Networking together into a unified whole. As part of this messaging emphasis, all three phones have a QWERTY keyboard. This is a loud and clear message from Nokia as to what they think about touch screen keyboards. 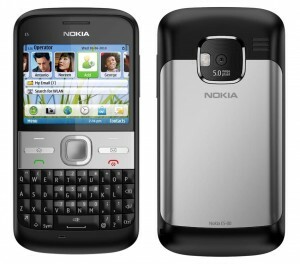 Another theme that ties these three phones together is their low cost with Nokia clearly wanting to bring smart phones to the low and mid tier markets. While none of these phones are ground breaking, and may invite yet more of the same-old tired Nokia bashing, these three may prove to be ideally placed to sell in large numbers, thus maintaining Nokia’s market share. Note: All prices quoted are before taxes or carrier subsidies. Starting with the lowest featured of the three, we have the C3. 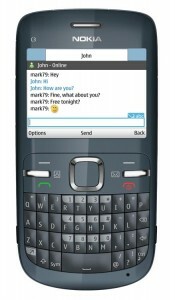 Coming in at a mere 90 Euros, this is the first S40 phone to feature a full QWERTY keyboard, and has more than a passing resemblance to the E71/E72. This one is lacking 3G and GPS, but has WiFi and a 2MP fixed focus camera. Next along is the E5, the latest Eseries device. Just like the E72 before it, the E5 runs on S60 3rd Edition Feature Pack 2. While it may be lacking in the looks department, it packs in most of the best features of the E72 for a fraction of the price, just 180 Euros.While the E72 had an auto focus 5MP camera, the E5 is sporting an “Extended Depth of Field” 5MP camera. These have been seen before in the E52/E55, and work quite well at capturing various focal points without using an actuating lens. The E72’s optical d-pad is missing here, but that’s hardly surprising given the cost. Last along, and probably of most interest to mobile geeks is the full QWERTY side sliding C6. 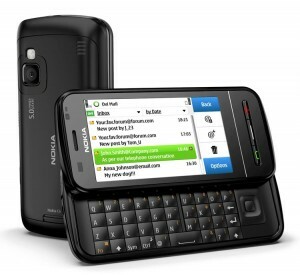 This is a Symbian^1 device sporting the same home screen widgets as seen on the N97 and N97 Mini, and is the only phone of the new releases to be sporting a touch screen. The C6 will be released with a price tag of 220 Euros. An obvious place to highlight compromise is the camera; compared to the N97 Mini and 5800 Xpress, there is only a single LED flash and no Carl Zeiss optics. Although the 5 megapixel resolution has been maintained. Also staying the same is the 3.2″ nHD 640×360 resistive touch screen. The C6 is interestingly placed. It could be reasonably touted as a poor man’s N97 Mini, lacking the high-end camera components and tilted screen. Although a positive perspective on the C6 is that it’s actually the love child of the touch-only 5800 and non-touch sliding QWERTY 5730.